Richard graduated from American University in Washington, D.C., with a major in finance and accounting in 1987. He waited three years before entering the Southwestern University School of Law in Los Angeles, receiving his Juris Doctor in 1993. He worked briefly as a clerk in the United States Attorney’s Office in Las Vegas and then he joined his father Melvyn Jacoby’s firm in 1994. 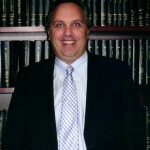 Richard is a member of the Suffolk County Bar Association, the New York State Bar Association, and the National Association of Consumer Bankruptcy Attorneys.